Legal matters of all natures should always be resolved with determination and sensitivity. 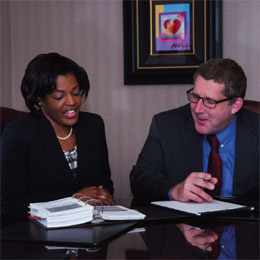 Karen Ann Ulmer, P.C., a law firm that specializes in family law, including divorce and custody, as well as estates and real estate, recognizes that legal issues can be often daunting and confusing for prospective clients. In return, the firm offers a free initial consultation by phone to gather information and questions in order to best serve a potential client. All five attorneys address some of the most common questions that clients have asked, however, if you find your question is not answered here, you can always email the firm at kupendergast@ulmerlaw.com. The firm has two offices with locations in Langhorne and Doylestown and services the entire Southeastern Pa. area and Southern and Central New Jersey area. What is mediation and is it something worthwhile or a waste of time? Is it better to offset a pension value or have a pension allocated by QDRO? How do I ensure my alimony or support payments can be deducted by IRS? Who can you file a Petition for Protection from Abuse (PFA) Order against and how does the process work?